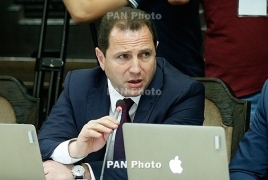 PanARMENIAN.Net - Acting Minister of Emergency Situations Davit Tonoyan will be appointed the Defense Minister, Prime Minister Nikol Pashinyan told reporters on Friday, May 11. Pashinyan is currently in the process of the formation of a new government after protests led by himself ousted former prime minister Serzh Sargsyan. The National Assembly elected Pashinyan as the head of government after massive protests and civil disobedience paralyzed traffic in Yerevan and the rest of the republic for several weeks. On Thursday, Armenian president Armen Sarkissian, with Pashinyan's proposal, sacked the heads of the country’s police and the National Security Service, appointing new chiefs instead.